What is IRS Form W-9? Anytime you hire someone, or engage in a business relationship with an independent contractor, you must generate an IRS form W-9, Request for Taxpayer Identification Number and Certification. If you're an employer, or even just making a payment to a vendor, you've got some responsibilities to Uncle Sam. Anytime you hire someone, or engage in a business relationship with an independent contractor, you must generate an IRS form W-9, Request for Taxpayer Identification Number and Certification. You need to have your employee or contractor fill it out and sign it so you know their Social Security number or taxpayer identification number of U.S. persons attempting to work in the United States. You don't need to send it in to the IRS. Keep it for your records, so you'll have it when you generate your W-2s and 1099s. Who is a "U.S. person?" The term "U.S. persons" doesn't just refer to "people." In legal terms, a U.S. person can, of course, be an individual, as long as he is a U.S. citizen or legal resident. It could also be a corporation, an association or company, or an estate or trust organized under the laws of the United States. Foreign estates are not "U.S. persons." When do I use a Form W-9? Use Form W-9 to collect the taxpayer ID number or Social Security number of any U.S. person you plan to engage in a business activity. Use a Form W-8 for foreign entities or individuals, or Form W-7 for individuals who become U.S. residents for tax purposes but who aren't eligible for a Social Security number. What is included on a Form W-9? Form W-9 asks for the taxpayers' name, business name and taxpayer ID number, which is either the taxpayer's Social Security number or employer identification number. The signer, or "payee," must sign the form certifying that the information is correct, and that the signer is either a U.S. citizen, resident alien, or the representative of a company, corporation, partnership or other U.S. person. What happens if a W-9 is not filled out? 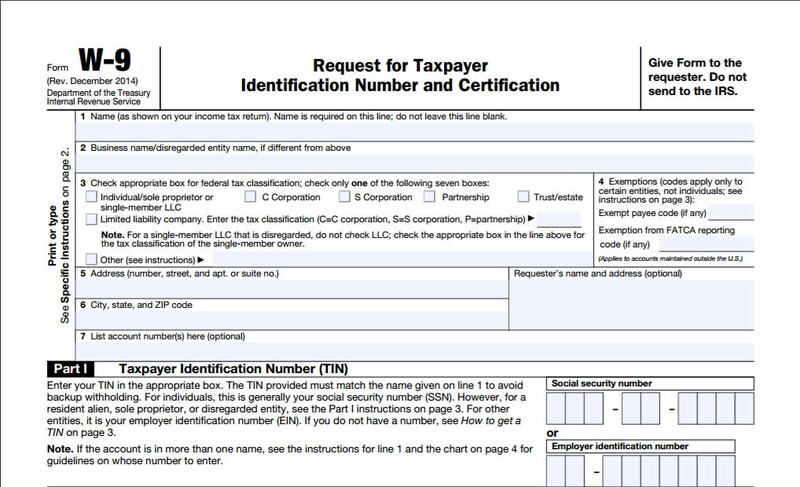 If you don't fill out a W-9 duly requested by an employer, partner or other entity duly entitled to your taxpayer ID information, you may be penalized $50 for each instance. You may also be subject to backup withholding, which means the payor will withhold 28 percent of your check and forward the proceeds to the IRS. If you file a false statement that results in no backup withholding, and you are not exempt from the backup withholding requirement, you may be subject to a $500 penalty per incident. If you falsify information, you may be prosecuted for criminal behavior, and even imprisoned. If you receive a W-9 from a worker or vendor, and you misuse that confidential information or disclose it improperly, you may be subject to criminal and civil penalties. In other words, if you’re asked to complete a W-9 form by someone you’re doing work for, it’s best to do it promptly and accurately.